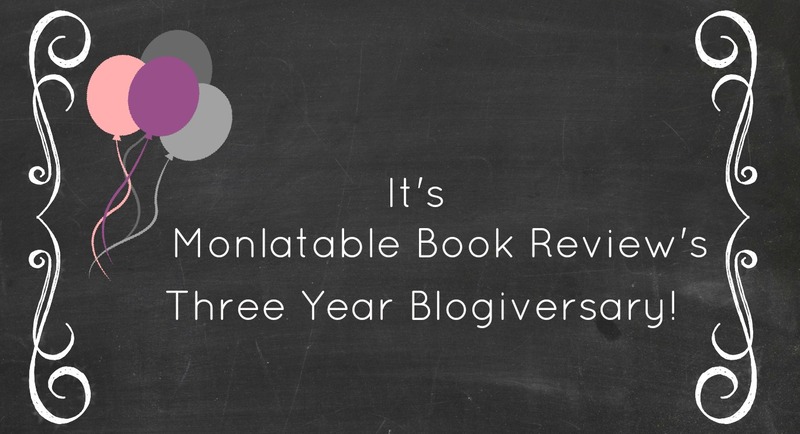 Monlatable Book Reviews: Three Year Blogiversary & Giveaway! For fairness, I had my daughter randomly pick three names from the comments for the winners. You ladies have until Wednesday at noon to email me at monlatable@gmail.com to claim your prizes. Thanks to all you stopped by, commented, and entered! I can't believe that it's been three years since I first began this blog! The time has gone by so quickly. Blogging has been one big learning experience for me. I have learned a lot, stumbled and fumbled around quite a bit, and it's taken three years, but I hope that I have finally found my groove here. My blog has changed quite a bit over the last three years, especially the last year. I am an eclectic reader so my interests are all over the place which is definitely reflected by the things that I post. I have 'met' some awesome fellow readers because of this blog, and made what I hope will be long lasting connections to people who share the same interests and love of books as me. I am so grateful to everyone who stops by my blog, leaves the occasional comments, and for the supportive emails that I have received over the years. There have been a few times when I seriously thought of just letting this blog go, but just one encouraging message can make all of the difference! As a thank you, I am doing a giveaway of some of my favorite bookish things! I love to jot down notes on the books that I am reading in pretty notebooks, I love a good pen, I love to sip coffee, tea, or hot chocolate while snuggled up on the couch with a book, I love bookish chachkies, and I always have a book tote in my car in case I feel the urge to stop into a thrift store and hunt for book bargains. So, of course, I wanted to share one of each of my favorites as the grand prize! I'm making this giveaway SUPER simple! Just leave a comment below-it can't get any easier than that! I'll announce the winners on this post as an update on Monday August 8th at 4 P.M. The winners will have until Wednesday August 10th at noon to email me at monlatable@gmail.com to claim their prize or I will choose another winner. Grand Prize: One of my favorite Peter Pauper Press notebooks, a green wood pen, a 'Go Away I'm Reading" wood sign like the one I have in my bookcase, a large book quote ceramic mug perfect for large quantities of your favorite beverage, and the 'Reading is to the mind what exercise is to the body.' book tote. Second Prize: A spiral bound lined notebook and the 'Books are the quietest and most constant of friends' tote. Third Prize: I will gift one person their choice of one ebook from either my 2014 or 2015 favorite reads list. Not entering but congrats Monica!!!! Ooh... Nice swag! And happy anniversary! Thanks for stopping by Patrice! Thanks so much Sharonda! You've been an awesome book buddy! Thanks Tanja. You know I love KT Book Reviews too! Thanks Kathy! Thank you for inspiring me to give blogging a try! Thanks for the awesome giveaway! Happy Blogversery!!!! Thanks for stopping by Alisha! Happy Blogaversary! I've just recently discovered your blog and looking forward to spending time here! Happy Happy Anni and this is my entry into your giveway. Love and tons of blessings! Three years, and you know blogger years do equal dog years. But I do hope you post a review of the Underground Railroad when you get a chance to finish it. I think I will have to wait to read it. I will definitely review it! Thanks for stopping in! Congrats and Just shared! Awesome swag. Thanks so much for the share Amarie! Thanks for all you do! Because of this awesome blog, I've found SO many great new authors! Thanks for the giveaway opportunity, and keep up the good work! Omg!!! Just saw this and email sent! Thank youu!! !